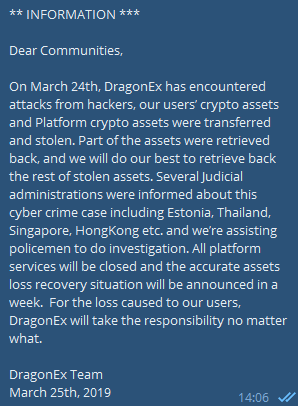 DragonEx has not released any further information on the value of the losses or who it has affected. DragonEx is an exchange that supports the trading of Bitcoin, BCG, ETH, USDT, NEO, QTUM, EOS, SAFE, IQ and some other less popular virtual coins. The company claims the exchange is “a safe and stable platform” for the trading of these tokens. Judging by the statements provided, DragonEx is working with authorities to get to the bottom of how this hack occurred and how to retrieve the stolen digital assets, if it is possible to retrieve more than they already have. Joanne Long posted to Telegram once more asking for help from the cryptocurrency exchange community. She states that the stolen assets were sent to a number of addresses and posted the name of the address, asking for help in traces in them. It appears that the stolen digital coins were then transferred to other prominent exchanges such as Bittrex, Huobi, and Binance. The coins transferred from the addresses listed by Joanne Long were frozen on Huobi. All of the updates have come via Telegram while DragonEx’s Twitter account remains silent, and is also restricted. Twitter often restricts accounts if their algorithms detect activity deemed outside its terms of service, such as automated activity. When this happens the account will become restricted and other users will be warned about the account and ask if they want to proceed in looking at the account. Perhaps their Twitter account has also been targeted in this attack? There has been plenty of hacks and attacks against crypto platforms recently: the Cryptopia hack, Japan’s Zaif hack and the gate.io attack to name a few. We will keep following the DragonEx’s hack story and update if and when there will be any significant development.